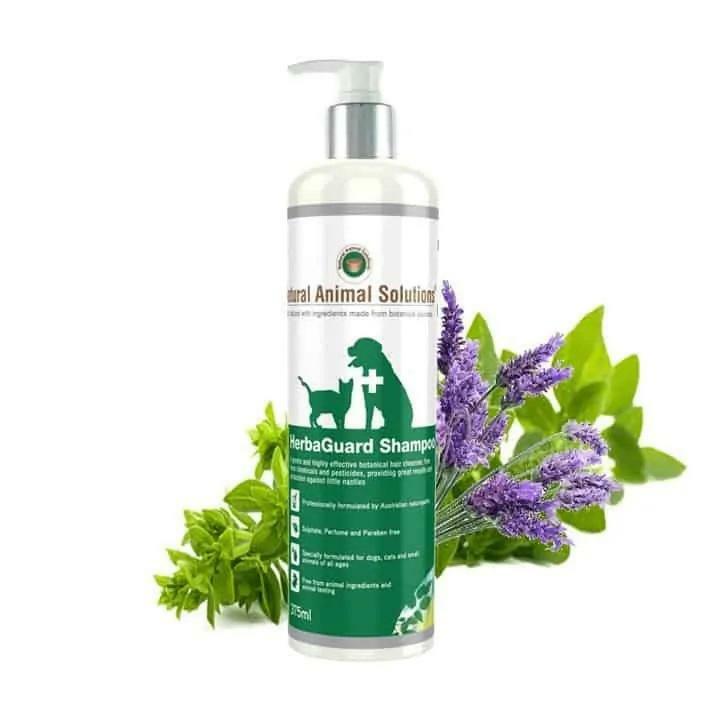 HerbaGuard Shampoo is the perfect natural solution to clean your pet"_s skin and coat, while forming a protective barrier against some pests. All ingredients are selected from botanical sources and blended into a low irritant formula, making it perfect for use on ALL skin types. Developed by our skincare specialists and can be used in conjunction with Natural Animal Solutions"_ HerbaGuard Powder. Many popular brands of shampoo may provide a protective barrier against pests, but unfortunately they often contain perfumes and chemicals that can irritate your pet"_s delicate skin and coat. If your pet has sensitive skin, you should be using a gentle and natural shampoo, just like our HerbaGuard Shampoo. Natural Animal Solutions"_ HerbaGuard Shampoo is the perfect natural solution. This shampoo is 100% natural, contains only botanical ingredients. HerbaGuard Shampoo also contains specially selected low irritant ingredients making it perfect for use on ALL skin types, including delicate skin. Directions for washing your pet"_s coat the NAS way! As with all shampoo and conditioners it is best to avoid getting HerbaGuard Shampoo into your pet"_s eyes.